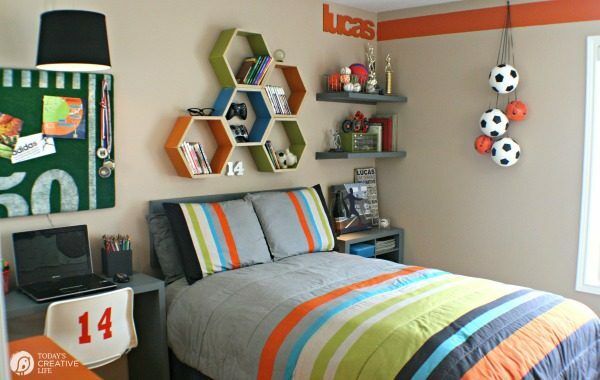 Cool Bedrooms for boys can be hard to find and boy bedroom ideas for teens is especially hard to find. Decorating a boy bedroom with room to grow is no easy task. This sports theme boy bedroom makeover lasted 6 years before we updated any of it. Last month I was thrilled to become a part of the Lowe’s Creator Team. 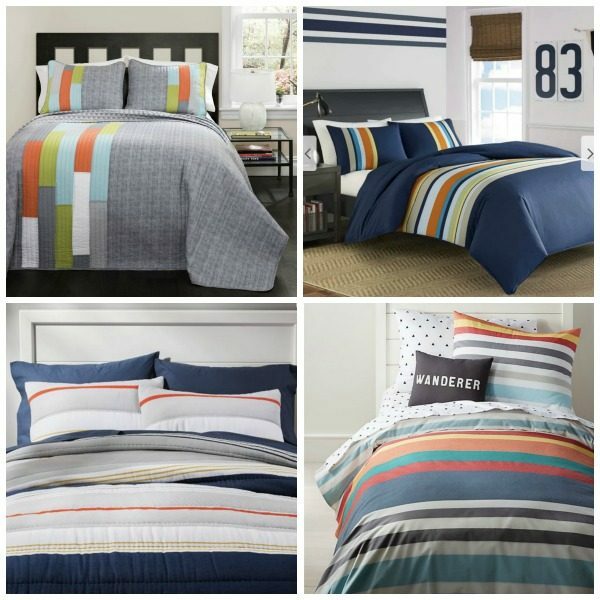 I was even more thrilled to learn that April was a “Room Makeover” task and started looking for a few ideas for cool bedrooms, especially a Sports Theme Bedroom ideas for boys! My son’s bedroom needed a makeover in the worst way. It had been in transition for about 2 years and I was stuck. We were swapping out the “explorer” theme into something more teen approved. As you can see, I didn’t even pick up for the before photo……..just keeping it real folks. 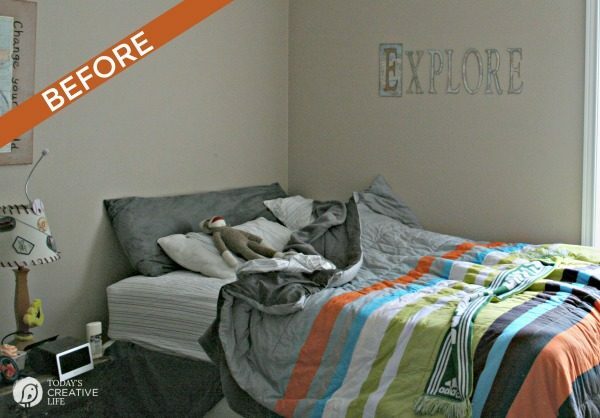 With a budget of $300 and no extra time to paint the walls, I was happy this boy bedroom makeover was able to use the existing wall color and bedding. It was falling together midway. The bedding was from Target years ago. I have optional bedding listed below. Lowe’s gave me full reign to go in and buy what I needed………..well not actually…….but they did supply the materials needed. I felt like I had full reign. Because I wanted this to be FABULOUS and because I knew I’d be working on a tight budget and schedule, I enlisted help from a dear friend of mine. It helps to have dear friends who are much more talented than you. Friends who can actually take a vision to creation and have it work. Not everyone has a friend who is a professional designer, but I swear to you, the ideas we came up with are all things YOU can do too. Aaron Christensen is a FAMOUS ARTIST! 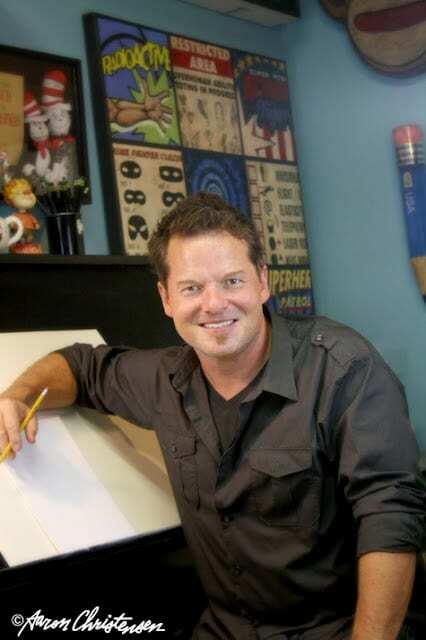 He’s known for designing cool bedrooms for children. He’s also very humble and he’ll roll his eyes when he reads that, but I think if your art is in Anthropology, Pottery Barn Kids, Land of Nod and more……YOU. ARE. FAMOUS! And I know him………and I used to teach “aerobics” with him….I used to eat snicker bars cut up into “truffles” with him,…….and I got to spend the full day with him recreating my son’s room. What a lovely day it was. It was fun to stage the room with a “professional”! Bi-Fold Closet Door – Used to build the shelving, a headboard, and the desk. Artificial Turf – he made the memo board. Hexagon Shelving – He built these. You can find similar ones here on Etsy. Aaron built shelving, a headboard and a desk using a bi-fold closet door. Much less expensive than buying a new desk or lumber. The side table you see above was a ClosetMaid cube organizer. And we used a LOT of Valspar paint samples. Every boy’s bedroom needs a memo board! The bulletin board was made from an artificial grass patio rug we found at Lowe’s. The man is a genius when it comes to designing a kids room. Using a little spray paint for field lines added an original appeal to the room. Just below the bulletin board is a hand made desk just big enough for my son’s laptop or school work. The room wasn’t big enough for a traditional desk, but this one made from bi-fold closet doors was a perfect size. He’s building a few of these for a client and thought he’d show off and whip out a few for Lucas’ room. I LOVE THEM! I think they add the perfect dimension and color to really pull the room together. You gotta think outside the box……no pun intended. Here’s my little man below enjoying his new room. He loves it. I love it! Thanks to Aaron, we have an amazing sports theme boy bedroom and thanks to Lowe’s for providing all the materials needed. The bedding used for this room is no longer available, but I’ve found a few ideas that are matching in style. And of course, it can be used for girls too! I would makeover my 16 daughter’s room! After spending the weekend helping her clean and organize her room, she deserves the makeover! She donated 5 bags of clothes! I am so proud of the hard work she put in this weekend. If we win, it would be so much fun to work together to make a super-special room for her! Thanks for your blog of ideas! Love the bedroom! And love Lowes! 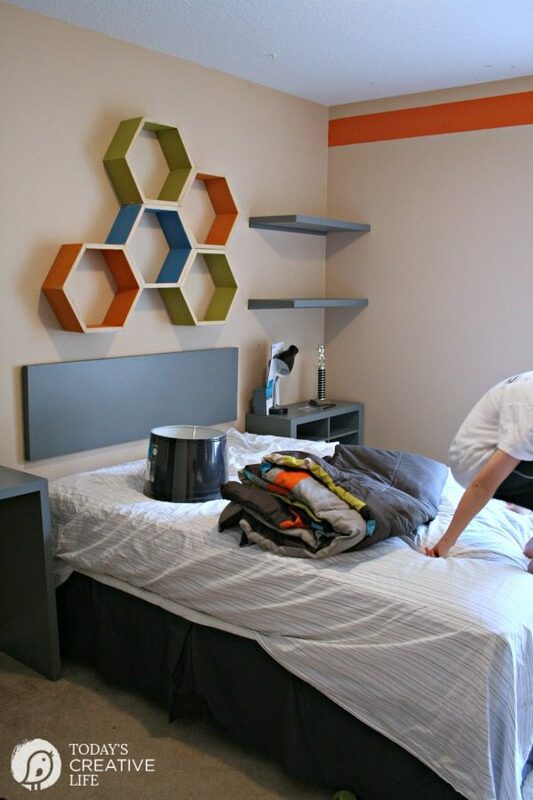 Would love to try to make those honeycomb wall shelves. Kim, what a fantastic room. I love it. I’d love to be entered into this great give away! I love the hexagons! I want to go out right now and get some wood to make them. They would look so on my daughter’s rooms and my craft room. Wish I had a gift card to Lowes to buy the wood! I am so jealous, could you please send Aaron my way! I am making over a playroom into two different rooms,currently working on the nursery so this lowed card would be used! Love your son’s room – I would use the card to buy paint as I really need to paint my walls. I have been receiving the Lowes magazine for years and love it. Awesome room!!! I’d use a card either to do something for my own bedroom, or to get a new light fixture in my dining area. Even though we just got the current one 3 years ago….it’s just not ‘right’ after all. I would use $100 from lowe’s to offset the little “gotta-do” list as our house its for sale. Example: “gotta replace 2 sets of windows” and “gotta get a new hvac and a/c system”! Every wall in our new house is white. I would buy paint! How very cool! Love the ideas here. I would probably make some shelves or some other type of storage for my craft room. I love this room! I’m going to save the idea for when I’m ready to do my boys’ shared room. My DH is always at Lowes picking up things we need. Your bedroom makeover is really spectacular! I love those honecomb storage units. Very cool. We bought a property not long ago and we are making improvements to it. So I’m sure the girt certificate would come in handy for all the upgrade projectsw e have in mind. Thanks for the chance! I would use the $100 card to buy paint for a guest bedroom that has been neglected too long and is in need of an update. I have the new accessories for the room but don’t want to use them until the room is painted. Please enter me for a chance to win the giveaway! I need paint for a guest bedroom sorely in need of a change! I signed up for the Lowes magazine. I would use the certificate to buy paint and crown molding for my bathroom. I would use it to update my son and my daughter’s rooms. The shelving ideas are great! Just pinned the bedroom! I love it! We are getting ready to redo our family room so I would use the $100 for that. I signed up for the magazine. Subscribed to Lowe’s Magazine via YouTube. awesome makeover. my teenage so is also in need of a bedroom makeover! i follow u on pintetest! i also signed up for the magazine. Your son’s room is absolutely awesome! Glad he’s happy with it, too. Great job to you and your friend Aaron. The flooring will be here on a couple of weeks, and then we’ll make our final decisions on paint for three different rooms, so the gift card will definitely help out! We already get the Lowe’s print Creative Ideas for the Home issues at our home. It always has great ideas and colorful photos to help! Just followed you on Pinterest! What wouldn’t I use it for?? I’m in Lowe’s so often I feel like I’m single-handedly keeping them in business! I subscribed to the magazine. I’m now following you on Pinterest. I am registered to receive Lowe’s Creative Ideas… Thanks for the giveaway! Hey Kim – Lucas’ room looks GREAT – so colorful and very age appropriate. As usual you made it happen – well done! 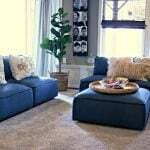 I’d love a $100 Lowes gift card – I need to make my new apartment OURs – tough to move from a house to an apartment – and I need to do some personal touches. $100 would come in handy. Would use the card to add elements to of the rooms in my house! I signed up for the Lowe’s Magazine! I would use the $100 from Lowes to redo my daughters room. Right now it is the bare minimum & I’d love to add some more personality. Thank you for all the great ideas & this great opportunity. I signed up for the Creative Ideas Magazine from Lowes as well. The room looks awesome, great job! I’d use the gift card for Valspar paint! I’ve got rooms in major need of spackle and paint! And maybe some of those recessed light conversion kits and pendant lights! What a fantastic room! We have had friends living with us for nearly a year and they are moving out this week. If we won the $100 I could finally update our basement with wainscoting and paint…or change our stairs to banisters…or retile our bathrooms since the laminate is coming up in the corners…or I could keep going…I have a whole Wish List! oops.. forgot to add this to other comment! I signed up for magazine! I would finally finish my sons’ Cars bedroom makeover! Thanks for hosting the giveaway! We already get the Lowe’s Creative Ideas Magazine! Love it! My husband loves to look through it for ideas as much as I do. I would redo some of my bedroom & some of my 5 year old daughter’s bedroom! I would put it towards a new front door. Very cool bedroom makeover! If I would win the Lowe’s gift card, I would use it for one of two projects. Our master bedroom is in DIRE need of some organization, such as shelving and storage. The other possibility would be to update our front yard. We recently started pulling up some overgrown ivy in our landscaping, and would love to use a gift card to help us spruce up our curb appeal. I LOVE Pinterest! I’m excited to be following you now! Out of bifold doors us the perfect size! I have 4 sons ages 10, 11, 13 and 14 and I would love to be able Bless them by fixing up both bedrooms that are shared. Right now both rooms are just so plain! Both room have a bunk bed, a dresser, a t.v. and bins for toys. I would love to brighten them up and personalize them with what the boys like! 🙂 I Love My Sons and It would mean so very much to me to be able to Bless them with a cool room! I signed up for Lowes Creative ideas magazine. WOW!!! I mean WOW! So many great ideas and inspiration! I need that bulletin board in my son’s room! This is not an entry…I just had to comment and let you know how much I love what you guys did! So talented!! I signed up for the emagazine! I would love to makeover our bathroom! Thanks for the chance to win! I would love a Lowe’s gift card! I would buy some paint to update our home. I love this! 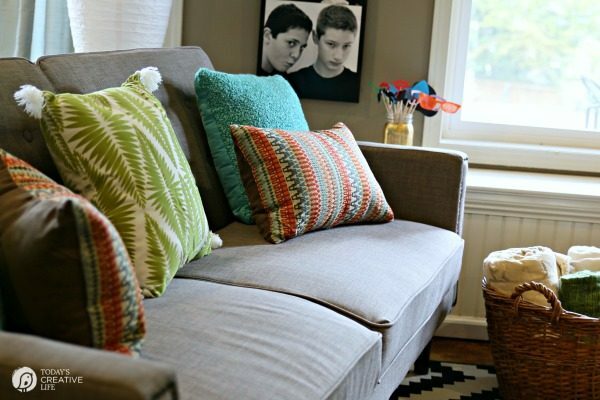 My own son is turning 14 next month and I would love to give his room a face lift as a birthday surprise – a Lowe’s giftcard would certainly help to make that happen! I already get the Lowe’s magazine, and I look forward to each issue. If I won the giveaway, I would use it to help spruce up the side of my house. We have been wanting to put in a stone walkway. The room looks great. I would use the money to finish up my kitchen. Kim this is FABULOUS!! how lucky you are to have a friend like Aaron to help you! I want to do Allison’s room and don’t even know where to begin! I might give a try to that fabulous multi-colored wooden entry mat that was in the Creative Ideas book. I’m a member of the mag online and I receive the paper-copy. I love it! Great job!! If I win the gift card I would use it to make over my own room! Our guest bathroom is in desperate need of new flooring. If I receive the gift card, tile aisle, here I come! I would use it towards redoing my bathroom or laundry room! Thanks for the chance! I would use it as soon as I find a house to buy for my granddaughter’s bedroom. I love what you did with your son’s room! I have 4 children, 2 boys and 2 girls. They each share rooms. 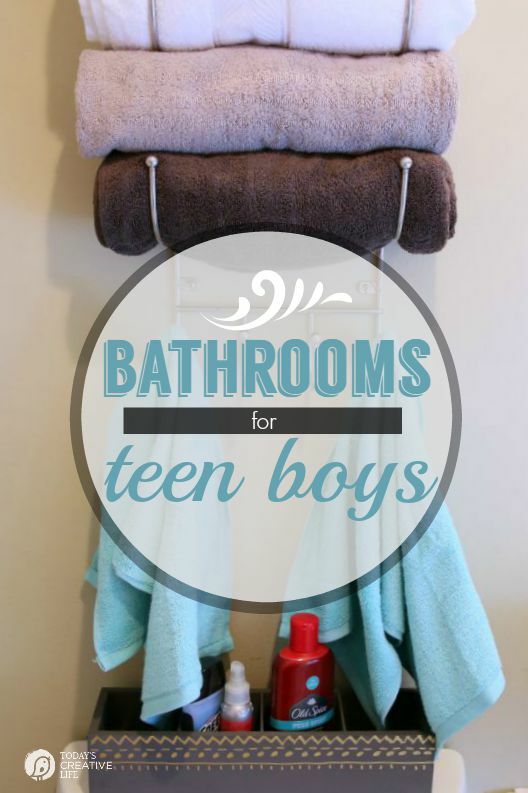 I would love to take to boys room, the smallest room, and get it organized and set for their teenage years. I saw this amazing desk made from bookshelf and a table… Perfect for a small room. I would use the gift card to spruce up my family room. It could use new lighting and paint. I receive the Lowe’s magazine. I subscribed to their magazine. I would use the $100 to update my son’s room. I would paint our living room and bedroom. I am so sick of the boring tan colors. We need are so in need of some color on our walls in our house! I would use it towards my daughters bedroom makeover. She turned 13 and I think she’s ready to move on from the flowers and clouds from 6 yrs ago. I would use a gift card to probably redo one of my kids’ rooms. They are both in dire need of some style updates. 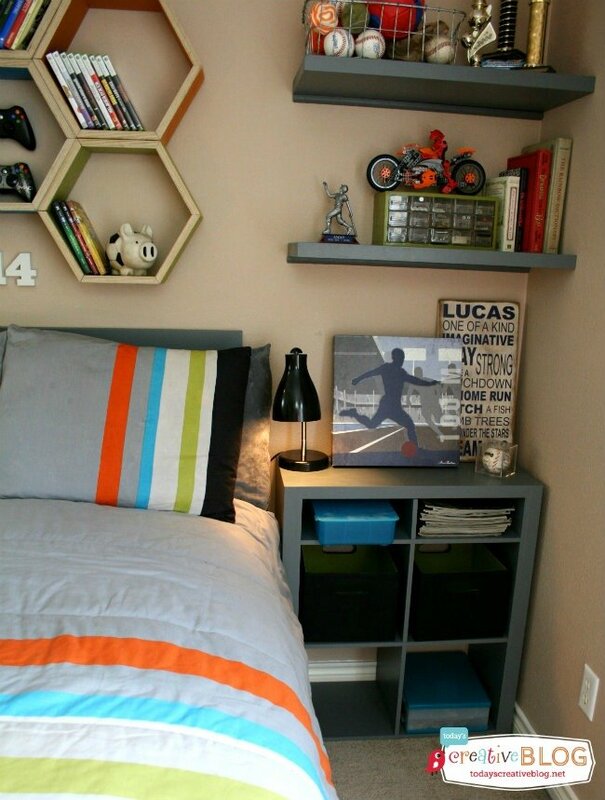 I love some of these ideas for a teen boy bedroom & I think I need to watch for the details. My little boy doesn’t like his “football” room. It is actually vintage Chicago Cubs Baseball, but he has no interest in sports. I want to redo his room in a vintage Star Wars theme, since that seems to make him happy. Need a great paint and some shelves to pull it together. Found the quilt at Target on the clearance for $20. My son’s room is A MESS! Would definitely use to spruce it up! I subscribe to the Lowe’s Creative Ideas magazine. I appreciate this opportunity! I would use the $100 for my husband to build us a headboard for our bed! He’s been wanting to build one for about 10 years, but it’s been on the bottom of our priorities list! It would be a great anniversary gift! His new room looks awesome! I would love to make over our little boy’s room. He just turned one and I think it’s time to have less of a nursery and more space to play! I could do so much! My husband and I just moved into our first house. We could use it to paint all the rooms (they are white right now). I want to build some shelves for our laundry room and bathroom. The light fixtures could be updated. We are thinking about building a mantle over the fireplace. The options are endless! I would love to add some finishing touches to my two girls rooms that we painted and rearranged last month. It is all in the details. Thanks and I love the honeycomb boxes! I’d use the gift card to help converting the garage of our new home (closing May 18th) into a crafting/sewing/quilting/guest room! Thank you for a chance to win! My son’s room in in desperate need of a make over. $100 would be a great start! I’d buy paint – and plenty of it. I have some good basic ‘bones’ but they need to be jazzed up, both walls and furniture. I even need to redo the bathroom cabinets. Very creative room!! Love it! I have a bathroom remodeling project coming up, so I would use a $100 Lowes gift card for that. WOW!!! that is one amazing room!! I love all the orange in there 🙂 There is one space in our house that is still builder’s white and that is the master bedroom. It is a sad place to be. Isn’t that always the case when you have a kid? there room gets all the attention and so does the rest of the house but when it comes to your own space, it gets put on the back burner. I would buy some decor for our new bathroom or some outdoor planters and plants for in them! I love this idea! I want to put the corner shelves in both of my kids rooms. I subscribe to the Lowe’s magazine! I would use the gift card to redo my dining room which is sad shape. I love your boy’s room! Gives me lots of great ideas for future projects. Thanks for sharing! We just bought our first home so I would use it to make up our children’s rooms. Your son’s room looks great! I joined the magazine too. We recently moved and have so much work to do on the new place. Like, every single room! I’d use the Lowe’s gift card to update our playroom – right now its pretty blah and boring and not fun and entertaining like a play room should be! I could totally redo decorate the guest room! My boyfriend and I are getting our first place this summer so this could be used to paint and also to get some rugs. Thank you! I subscribed to Lowe’s creative ideas magazine! I could decorate my home with the finishing touches that never get done. Bring in the bling to our home with Loews products that we see all of the time on the Nate show. I would love to do some creative shelving in my living room. WOW! that rooms looks amazing! i would love a chance to do something similar to my son’s room! you guys did an amazing job!!! I would use the card to get some sort of storage for my sewing area. I have a small area (only a desk) in my dining room that luckily has a fold out part that I can keep out for more room. Something I can put on my wall would be awesome. I subscribe to their magazine. I would use the gift card to decorate my new house! I’ve already joined Lowe’s Creative Magazine and love it!! Love the room, think those shelves maybe a good fit in my son’s room and I already get the magazine. I would love to pick out some containers for my kids rooms. Thanks for the chance to enter. We are working on some wainscoting for our formal family room/ dining room and would love the gift card for that! I’m fascinated with all the new paints like whiteboard and chalkboard and really love to paint anything, bonus if I can Modge Podge the creative project as well! 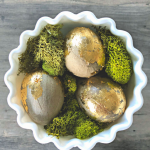 Love the metallic spray paints, too! I could SO use this for a bathroom makeover! I’ve joined you on Pinterest! I would love to start redoing the kitchen by painting the cupboards and walls and getting new hardware for the cabinets. 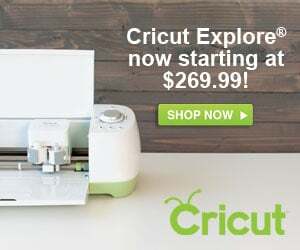 I would use it for all the things my husband says we need for spring! He’s already spent several hundred there, and it’s blowing my budget. At some point, I need to realize that spring comes around as regularly as Christmas, and I need to start planning for it. Would love to win this! I receive the Lowe’s magazine. I would apply to some paint…really needing to paint a few rooms. 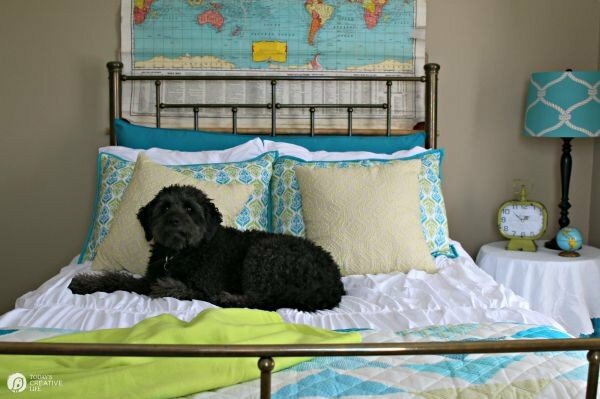 Such an awesome room makeover, that must be a very happy boy indeed! My guest bedroom/ office is in such a need of a makeover, I usually leave the door shut so that no one coming to visit might see it, it’s that bad. Thanks for the giveaway. The next project on our list is painting the outdated brick fireplace in our family room that takes up an entire wall. Also, redoing our small 3rd bath on the lower level. The sink & toilet need to be replaced, the floor needs to be redone and the wallpaper (shiny opalescent seashells) needs to go bye-bye, plus repaint the dark wood trim. Thanks for the chance to win! I joined Lowes Creative Ideas Magazine. Thanks for that link. I didn’t even know it existed! I am trying to spruce up my dining area. I could really use the hundred bucks to buy supplies to redo my new table! Thanks for the giveaway!! I’m wanting to make some changes to our front porch and general curb appeal. We have a wood deck on our porch and it needs either paint or stain, and the porch light & door hardware need some updating as well. I’d LOVE to paint our oak double doors a barn red color to update and brighten the area… Then there is a planting bed area that I’d like to make larger and add some new plants. I’ve already updated our mailbox, so cleaning up around it and adding some deer resistant plants would be great, too! Our bathroom is in desperate need of a revamp- poor thing is just wearing and tearing at the edges. And I love the new look! 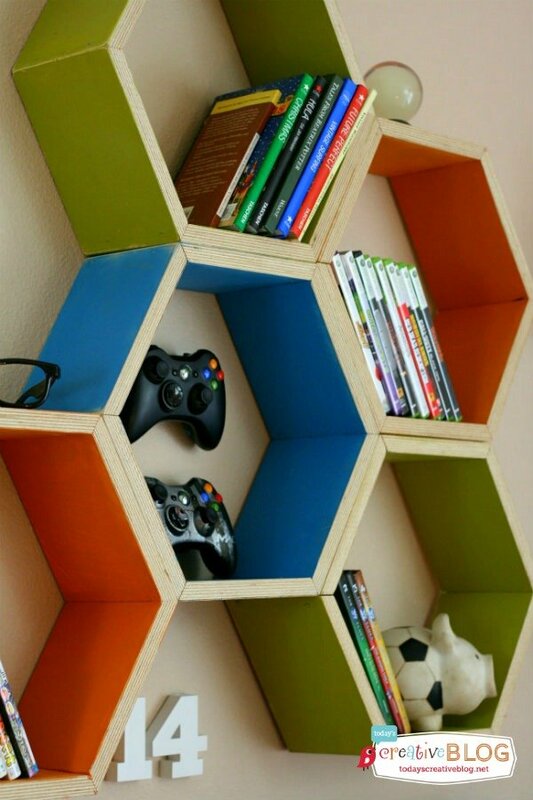 Especially the hexagonal shelving and the color tie-in. I totally love this boy’s room! I have been struggling on how to do our boys room and wanted a sports theme. If I had $100 in Lowes Gift Card I would definitely copy the Astro Turf bulletin board..and I love the name “Lucas” on the top followed by the line border!!! 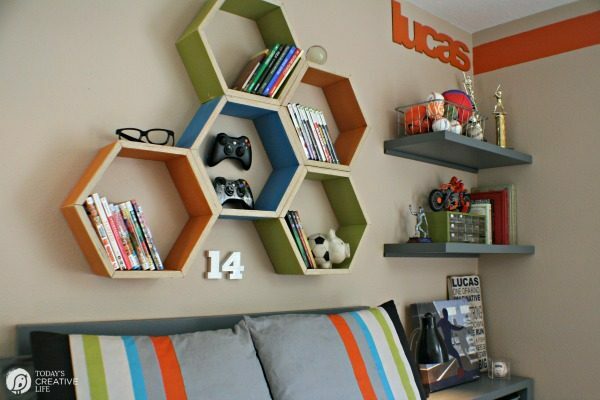 And of course the hexagon shelving! I have many rooms that need help. I would use the giftcard to buy a new ceiling fan for our spare bedroom and some new paint. Wow! What an awesome room! Sooo many great ideas! I’d use the $100 to organize my garage which also serves as my storage/craft/school space. So…yeah…needs A LOT of help! I would love to fix up the kids room or our office. I love the book self you did! Might have to try that soon! I am about to tackle my boys – ‘big boy room’ no more cribs! YIKES! Lowes would come in very handy, and I love the inspiration your sons room has given me! Seriously, I love it Kim. It is perfect for his age. I love all the details. The colors are very similar to my son’s room. This is a great room! I especially love the hexagon shelving and bulletin board! I need just those ideas to finish my sons room! Thanks! 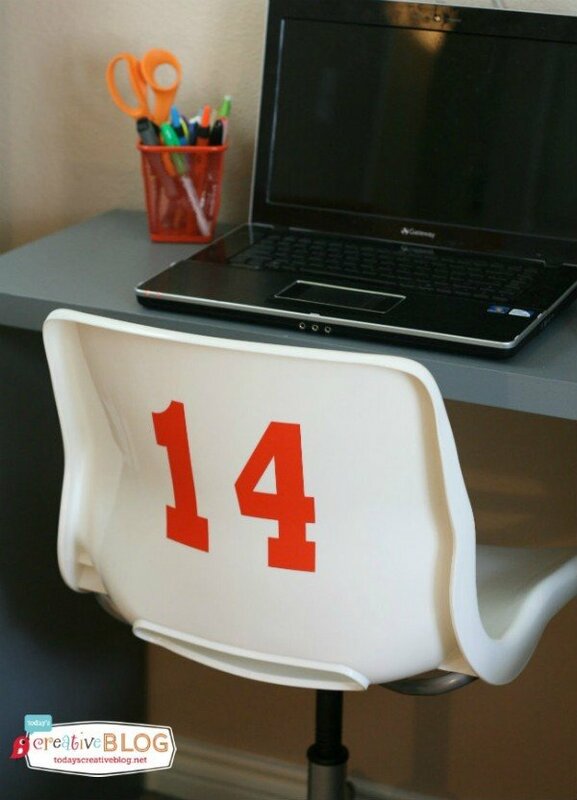 My favorite parts are the shelves, the bulletin board, the numbers on the chair — awesome! And I do not see how any of that was once a bifold door! Next, what would I do with $100 Lowe’s gift card? Yesterday I would have said spent it on our empty family room and re-grout the master bath. But now, totally try and copy the bulletin board and shelves for my son’s room and make a mini-desk like that for our office space! Oh, and I follow you on pinterest! After this who wouldn’t? I’d buy outdoor deck and garden working stuff. Thanks Lowe’s for a great giveaway! Your son’s room is fabulous! Great design and colors are terrific! I would use the card to get some closet organization supplies! i have a ‘sitting room’ i’m turning into a closet and i need lots and i mean lots 🙂 of things from lowes!! I would use it to redo by back stairwell that needs to be redrywalled and painted. Wow! Looks great. 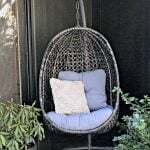 I’d use it to create my own little sanctuary in my yard. I would use the gift card to build some shelves in my hall closet. It is the scary kind of closet, the kind you open the door and things come flying at you and you just pray no one mistakes the door for your bathroom and accidentally opens it. True skeletons people…I need some shelves, Please help me Lowe’s and TCB!! 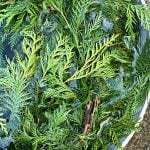 I would buy some yard/garden plants/decor. I would love to create a pantry in my hallway! Would love to get new faucets for my home and get rid of the builder ones. 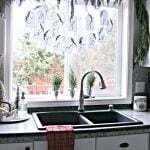 I also would love to get some moulding and to extend the moulding around my windows for some drama. I would use it to help remodel my bathroom! Well… in overachiever mode… first, I will finish my son’s room. I’m repainting it and building him a headboard. Next on the list is my bedroom coset, which desperately needs a makeover! I have three boys that need their rooms made over big time! Awesome ideas! I love your room!! I need to start on my Kitchen makeover. I want gioni granite on my counters, painted white cupboards and new backsplash. That is our next project! I love what you’ve done with your son’s room! If I had a $100 Lowe’s gift card, I think I would do the same thing. I think it would be so much easier for my whirlwind son to keep hexagon bookshelves neat and organized…more so than his tall, boxy, deep book shelf. My master bathroom is very sad. It needs new paint, curtains and a new showerhead. I am following you on pinterest now. With a $100 Lowes card, we could use it to finish up our daughters unfinished bathroom! And I’m already following you on Pinterest! That place is addicting! I would get paint and cool shelves. My boys have Legos, baseball cards and more that need to get off the ground and out of boxes! Love the room. Where did you find the beding? Perfect colors. Id use the gift card towards updating the house we just bought. The gift card will be used to purchase bead board wallpaper for my master bedroom remodel. Love it! Where did you get the bedding? I love how the room turned out! We are buying our first house now that my husband is retiring from the Navy!! If I won the gift card from Lowes, I would definetly use it to decorate our 5 kid’s bedrooms. I’ve gotten some many ideas from you. I would use it to buy some fresh paint for the walls of several rooms in my house. I’m signed up for the Lowe’s Creative Ideas Magazine as well. I follow you on pinterest 🙂 Thanks for this giveaway and the room looks way awesome! I would use $100 to Lowes to redo our master bedroom! The room looks great! I especially love the hexagon shelving. If I were so lucky to win the Lowes card, I would use it to by fund a planer for my dear husband for father’s day so he can get all his projects done! I follow you on Pinterest now. I can’t wait to see what I have been missing! I would use the $100 giftcard to finally purchase a living room rug!! That’s all I need to start off this room’s redesign. I would love to paint my guest room! For Christmas I redecorated my daughter’s bedroom. My son would love to have his room decorated as well so that’s what I would use the gift card at Lowe’s for. My poor son is in the same boat. He is stuck in a kiddie room while I try to make time/ money to give him an updated look he deserves. I love this look you created and would love to do something similar and this gift card would help give me a great start. I am already a pinterest follower- LOVE that site!! Hi. I LOVE this bedroom! Tons of great storage ideas for boys! I would like to work on some storage for my mothers upstairs. I would change out the light fixture in my bathroom and add some hooks for my boys to hang their towels! I would use that money for my boy’s room. I love the hexagons on the wall! With so much to do in a 800 Sq foot home….I have so many ideas!! With the gift card I’d like to design some new storage ideas for my children’s books! I love how this turned out and I bet Lucas is thrilled with it! My favorite element is the hexagon wall storage. Genius! I would love to win, and would use it to fix up my son’s room. I am already a subscriber to Lowes magazine. I am just starting to redo furniture for my home, being a newly we’d the nesting kicked in, but we are lacking anything beyond basic tools. I’d build up our collection and get an electric drill and maybe a few other necessities. I am also following you on pinterest! I would love a Lowe’s gift card! I would finally get around to painting my girls’ bedroom. I love redoing my house over and over. I’m now working on my dining room and would love to buy Valspar paint with the gift card!!! My favorite paint! Thank you! would make the backyard complete. I have so many projects I could use this on. Just had a baby and can finally spray paint again. Time to start building things! We’re expecting our second child in September and we could certainly use a Lowe’s gift card to help expand the space in our home to make room for our new little one. thanks for the fun ideas and an opportunity to win. I would use the gift card to buy things to help me to be more organized in my bedroom. I would use it to buy things to help keep my bedroom more organized. I would finish my bedroom that is still hanging in the air to complete. I would buy some lumber, harware and paint to make some floating shelves to go above windows in my little boys room. Oh what we could do with $100 at my husbands favorite store. My girls love Lowes build and grow, so many fun projects for them to do. Very cool! So needing to redo our boys room as well …. gotta ask how you got on that team?! Wow!! My 4 year old and 6 month old boys share a bedroom. Their room needs a MAJOR makeover to organize all of their toys! What an amazing bedroom! Simple, yet striking and so perfect for boys. I have twin boys and am constantly looking for ideas for their shared bedroom. I would use the gift card for new paint for their room, and new storage! I love the bulletin board. I would love to make one for each boy and personalize it. Hubby said he would make me shelves for my scrap area… but the raw material cost were too high. This Lowes card (thank you Lowes) is just perfect! thanks for thinking of us. I would paint my daughters room and buy her a toy organization storage. i have a whole list of projects i could use it for. a new kitchen faucet, batten board for the living room, paint for my daughter’s room, plants for outside. i could go on and on! we just moved from our 25 room house to an 8-room cottage. there’s so much to be done here and i would love to find paint and lights and so many other things. thanks for the chance to win. I love the room! If lucky enough to win , I would use the money for paint and some wood. I love the hexagon shelves. Wow! What a generous giveaway! I would probably give my gift card to my hubby- he’s just getting into gardening and this would help him get what he needs. Thanks for the opportunity! Holy Moly!! I LOVE it all. You are super luck to be able to work with someone so amazingly talented. Then to top it all off, money to LOWES!! JEALOUS!!! I have three boys and only one of them have a room that is for the most part completed. I would LOVE to have that $100 gift card to get started on the other 2 boy’s rooms. I’m crossing my fingers and toes!! Following you on Pinterest! Thanks again!!!! I am following you on Pinterest. I would use the gift card to buy paint to repurpose an old dresser. subscribed to Lowe’s. And now I’d use the gift card to make that adorable colorful wooden door mat! LOVE IT! Such a fun room and a great designer! Your son’s new bedroom ROCKS! I’m sure he loves it and will continue to enjoy it’s awesomeness for years to come. If I won a $100 Lowe’s Card, I would redo my home office. This is the one room in the house that I’ve brainstormed soooo many neat ideas for and would love to see them come to life! I do lots of graphic design and would love to have my office reflect my colorful, fun, contemporary style. 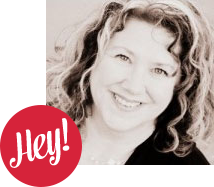 Following you on Pinterest – love that site! The room is awesome! We are moving in 4 weeks and for the first time my boys get their own room- so I’d use it for new stuff, for each of them. I am now following you. I would use the gift card for gardening supplies…just put in a memory garden in memory of my parents. Now following you on pinterest and Lowe’s magazine. I would use the gift card to fancy up my front porch! I have no idea how I would spend a $100 gift card to Lowe’s. I think I might look into buying a new sink for my husband’s bathroom, the sink is tiny with an itty bitty faucet that trickles water… he deserves better! We are lucky enough to have 2 full baths upstairs and he gave me the larger one, even though the smaller one is pink. That’s what I’d do with the GC! Great job on the room! Subscribed to Lowe’s too! Love Lowe’s! This is a wonderful give-a-way! 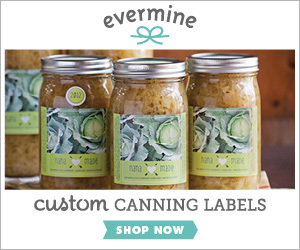 I L-O-V-E Lowes and I have been crafting like crazy lately and your site really gets those creative juices flowing! Thanks for this opportunity! I am will be 5 months pregnant on Wednesday and I JUST found out yesterday that I am having a boy! I already have a precious little girl and a house FULL of PINK so I’m going to need to do some serious working these next few months on my lil man’s NEW room and this giftcard would REALLY help out a ton with the construction of his new domain! I would totally revamp my girls’ room to make it more storage and hang out friendly! I love lowes! I would love to paint my 16 year old son’s room. I’ve painted the girls’ room but never his and he wants his done next, before mine!! I love the bedroom makeover! My son has that same comforter and I would use the gift card to finish his room. I love those shelves, they are awesome! WoW! My Son would SOOOO Love this! If I won the $100 Lowe’s giftcard I would want to work it into a room makeover for his space! Fantastic!! Thanks for the opportunity! I would use it to finish my little boys’ room! I would use it to finish our walkway. We have been slowly buying the blocks we need over time and it would be nice to go ahead and do it. I am following you on Pinterest, and I am already getting so many ideas!! Very creative ideas used in the bedroom do over. All well co ordinated especi8ally the color scheme. I recently retired. I would use the Lowe’s Gift Card toward redoing my bedroom. I now have the time to do a major renoivation of the room and up date windows, carpet and walls. The house is 65 years old and has never been updated. Already purchased a celing fan but won’t install until I have finished painting etc. I am a singlefemale and am doing the work myself. Lowe’s home improvement classes have been VERY helpful. I did finish redoing my bathroom last year. I Installed waisncoting. molding, carpet, new celing fixture and new cabinets. Retired and learning all new skills. What WOULDN’T I use a Lowe’s giftcard for?! My fiance needs a new toolbox, the whole house needs new paint, I want new towel rods and shower rods – it would help towards lots of different projects! I have been wanting to redo my living room. I would use it for paint and some kitchen organizers. What room in this house doesn’t need a makeover!? It’s hard to pick. I would have to go with my son’s room. It has bright red carpeting from the 70’s, that is impossible to vacuum. The ceiling is too far down, and not built well. The walls are fake wood paneling, and un-sticking from the walls. There is no closet, and no door! It really is an eye sore. I use it towards new appliances. They’re dropping like flies! I follow on Pinterest, too. I would use it to redo MY sons bedroom, he’s been asking for awhile now! 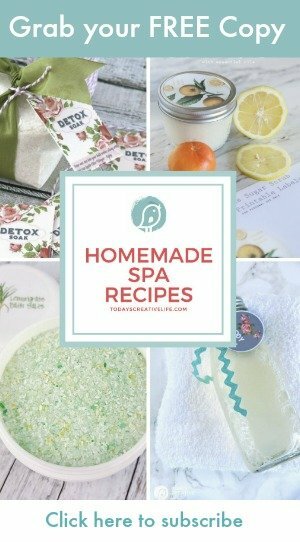 Following you on pinterest (craftykt)! Joined the Lowes Creative ideas magazine list. Sorry, I don’t tweet. I would use it to finish my laundry room or spare bedroom! I promised my daughter that we’d re-decorate her room when she starts Kindergarten in the fall. You know, cause she’s such a BIG girl now and all. 😉 I’d use the gift card to buy some paint, new window treatments, some stuff for her closet… Thanks for the chance! These are some fantastic ideas! I would use the gift card to makeover my son’s bedroom which is more the size of a large closet. These ideas – especially the bi-fold narrow desk – will really help. Thanks! Building a buffet for our dining room! I’ m currently doing my sons room and would love some extra money to do so. I love this room makeover! It is hard to find inspiration out there for boys teen rooms. 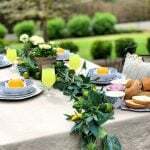 I would love it if you could come share at my link party! Have a wonderful day! I would use a $100 Lowes Gift Card to update my master bathroom. Besides a new coat of paint we really, REALLY want to rid the room of the out-dated gold fixtures (shower head, faucets, towel bars, etc.). We want to replace them with dark bronze fixtures to give the room a more spa like feel. But first, our goal is to save the money so that we can pay cash for the project! This room looks fantastic! I love all the simple ideas that you and your designer friend brought in. He can do amazing things with a bi-fold door. 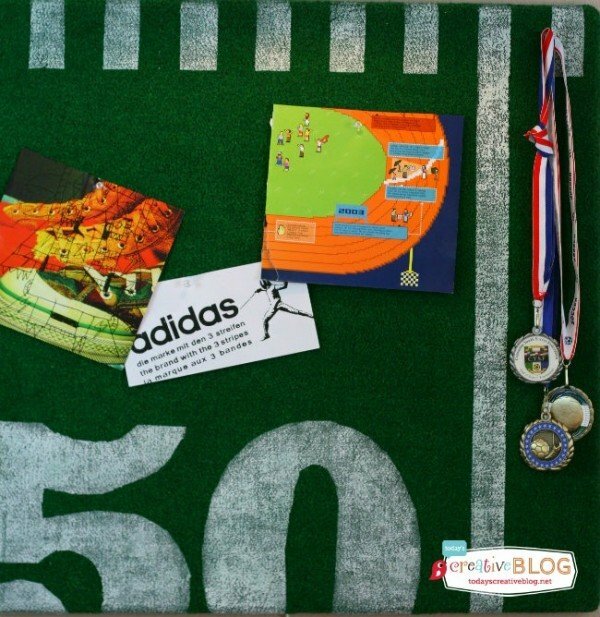 Love the astro turf bulletin board. Boys rooms are hard to decorate, you made it look easy! Great job! boy’s room. Lots of de-boyifying. Love to win. Over here from 36th Ave. I love the turf board. what did you use as a base? I signed up for lowes. I would use the Lowes for plants for the garden or a board and shelves for my son’s room. I would use it to finish the upstairs bedroom for my son! I read this and finally got my arse in gear. Bedding for the boy ordered & recieved this week!…we went to get furniture (the boy used to have unfinished furniture that we painted for the girl and then repainted for him- CRINGE NOW)…so the dresser is complete….desk is assembled…moms gonna play with gal pals tomorrow so Sunday IU’ll go in and start getting ti together…thanks for inspiring, it almost looks liek this but different theme since my boy is only 7… am gonna go to Lowe’s for non-tradional items (meal tiles) to use on walls…and for his lighting so I need that card! Love this room!! where did you get the bedding? I have 3 kids bedrooms to make over – the lowe’s card would help me get started! I would use the GC to buy some of the things on our HUGE to-do list, like new blinds, crown molding, and so much more!! !